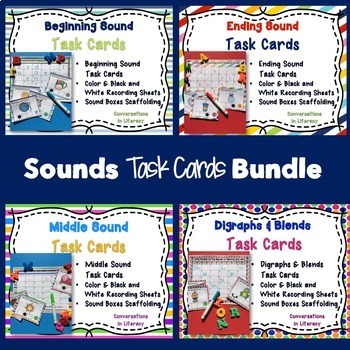 You can get all my Sounds Task Cards with Sound Boxes in one bundle! These resources will help your students practice hearing sounds in words. Purchasing the bundle saves you 20% off of purchasing them individually. Each task card also contains sounds boxes for scaffolding for your students. You can click the links above to see what each set contains and looks like assembled.